Between 1915 and 1970, as lynching became public spectacle, as a nicely dressed black woman might be arrested for “acting white,” as black sections of towns were burned down or terrorized, black sharecroppers and surgeons quietly fled the South for New York City, Detroit, Oakland—as far as they could possibly go. 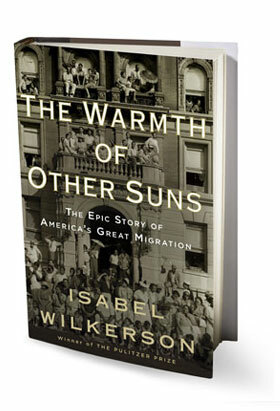 It was, as Pulitzer Prize–winning journalist Isabel Wilkerson masterfully demonstrates in The Warmth of Other Suns, this leaderless “silent pilgrimage” that brought us James Baldwin, Miles Davis, and the forebears of Michelle Obama; it precipitated the civil rights movement and created our cities and art forms. Wilkerson builds her lucid analysis on the journey her parents took and on the biographies of three who made the trip: George Swanson Starling, Robert Joseph Pershing Foster, and Ida Mae Brandon Gladney, who fled Mississippi for Chicago after a relative was beaten close to death for supposedly stealing a white man’s turkeys. Each narrative becomes a rich novella thanks to Wilkerson’s instinct for pacing and for her subjects’ idiosyncrasies. Scholarly but very readable, this book, for all its rigor, is so absorbing, it should come with a caveat: Pick it up only when you can lose yourself entirely.